North Fork Spring rises in the middle of the North Fork of the White River. Recharge Area: Similar to Double Spring, both the upper Gasconade and local sinkholes and losing creeks contribute to spring flow. Both North Fork and Double have shown algal blooms at times, indicating some nutrient pollution in the springshed. Interesting Information: North Fork Spring rises in the North Fork River, at the approximate location of the figure in the center of the picture. Spring comes up along a joint which crosses the river, with numerous openings in a 100 foot stretch of the river, from bankside openings on the left, a line in the bedrock river bottom and a gravel bar to the right. A nearby sinkhole with fluctuating water levels along this same axis may be related to the spring complex. Brief History: No history to speak of, since it lies basically in the river. The spring was discovered by taking river measurements above and below it, and noting the discrepancy in the numbers. Ownership and Access: Presumably private but free access via floating down the North Fork. 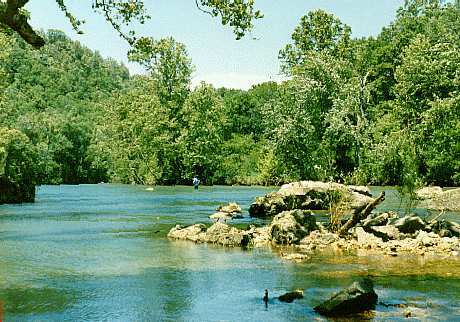 Missouri law permits river traffic on year round streams through private property as long as floaters obey No Trespassing signs, and do not venture on land above high water levels. Marked on topo map.